by Mistress Arwen Evaine fert Rhys ap Gwynedd, O.L. Casting beans and grain is only one of a myriad of soothsaying techniques available, and one which utilizes commonly available tools -- the beans and grain which every Medieval household had available. What's more, after their use in soothsaying, they could be restored to the larder unharmed. It was better if the grain used was supplied -- best of all, grown by -- the one seeking the Soothsaying. The Soothsayer, of course, kept the grain afterwards. Types of grain most commonly used were barley, oats, rye, and (if available) a large seed such as pea or bean. Each variety is assigned a "domaine" or arv (Norse for "inheritance"). This was a relatively limited "palette"; nowadays the variety of available grains is much better, and thus a casting can be more detailed. In the Current Middle Ages, it is rare that a supplicant carries these beans, grains and seeds with him or her. Thus, the well-equipped Soothsayer will have in her/his pouch vials of each, plus a clean (preferably virgin) white cloth a yard square. To use these tools, the Soothsayer first spreads out the cloth on a flat surface (floor, table, flat place on the ground). This is done with care lest the substrate influence the "lie" of the seed. The seed must lie as it is cast, and not be influenced in its final resting place by any irregularity. The cloth used should resist wrinkling and fold-seams; ideal for use in the Current Middle Ages is a crush-proof knit. In olden times, this was carried rolled around a cylindrical form (such as a case for your Rune-sticks, which would be about the size of a rolling pin). 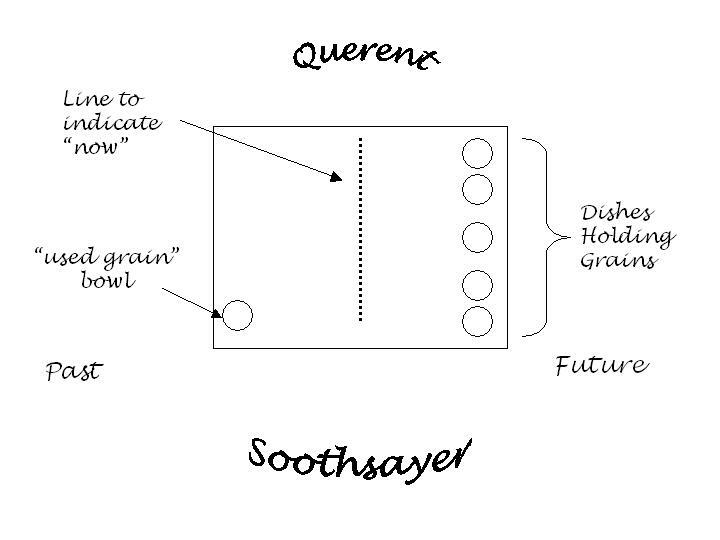 In reading the table is divided into zones, with "present" directly between Querent and Soothsayer. 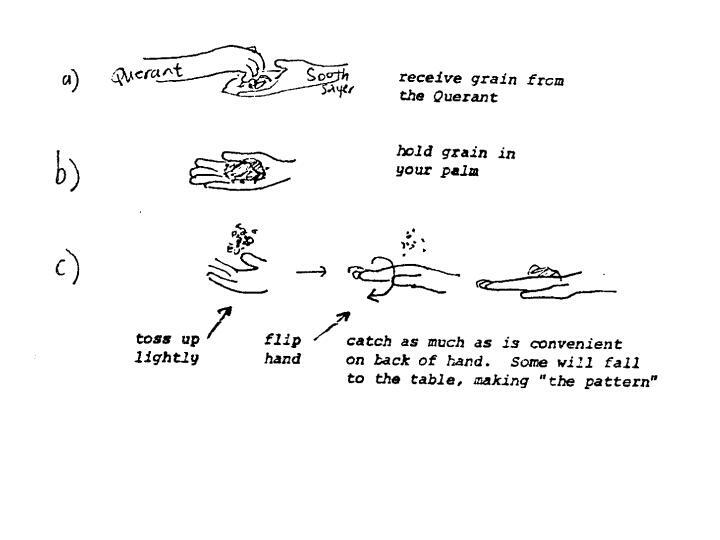 "Past" is to Soothsayer's left, and "Future" to the right; the pattern of the grain indicates the activity of the Querent. The nearer the center line, the more recent past or future the event - it's a gradient. e) The grain which you've managed to catch twice is returned to the pot whence it was taken. (It may be used in future readings.) The pattern of the fallen grain is then read. The process requires concentration of both parties. During the reading, bystanders should not interfere in any way. Casting #2. Beans (Arv of finance and business). 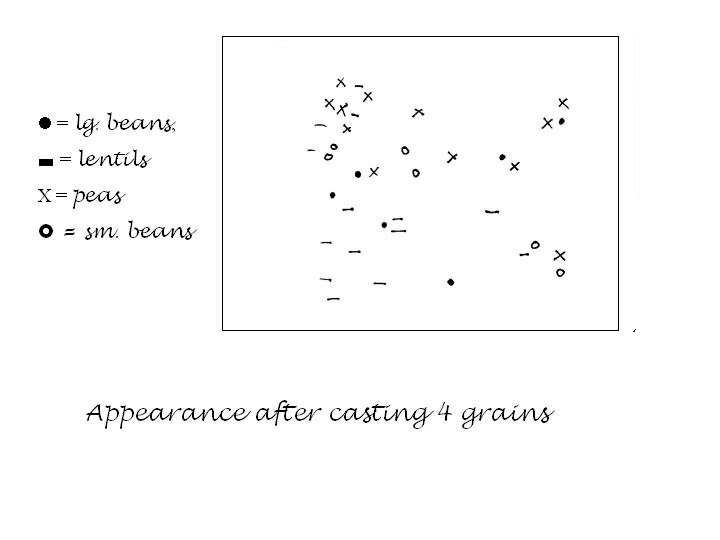 Cast as above, and interpret both in light of the positions of the beans relative to each other and also relative to the fallen lentils from Casting #1. Again, leave fallen beans in place. Querent 1. A teenage girl, about 15, with 1 or 2 giggling friends clustered nearby. Querent 2. A middle-aged married man, looks like an accountant but you find out he's a neurosurgeon. Read patterns alone and in conjunction with the lentils! 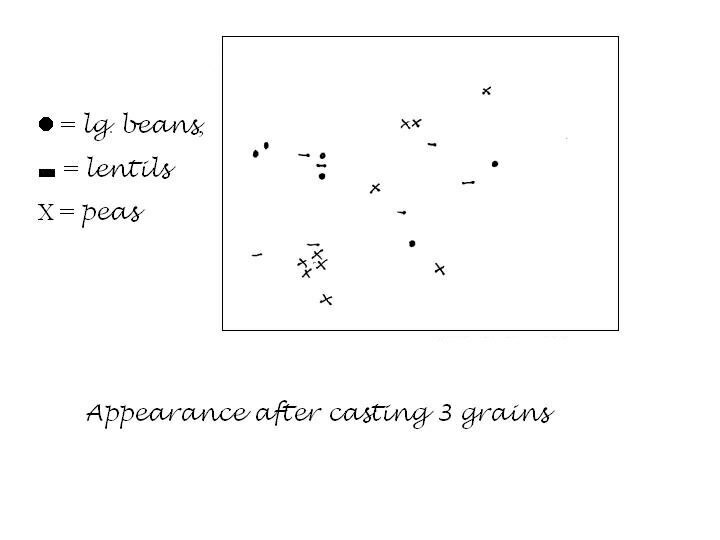 Beans falling and concentrating near a heavy lentil concentration tell me that that activity is/was/will be financial in nature. A regular pattern indicates salary (=steady paycheck). Casting #3. Green split peas (Arv of romance, love-life). 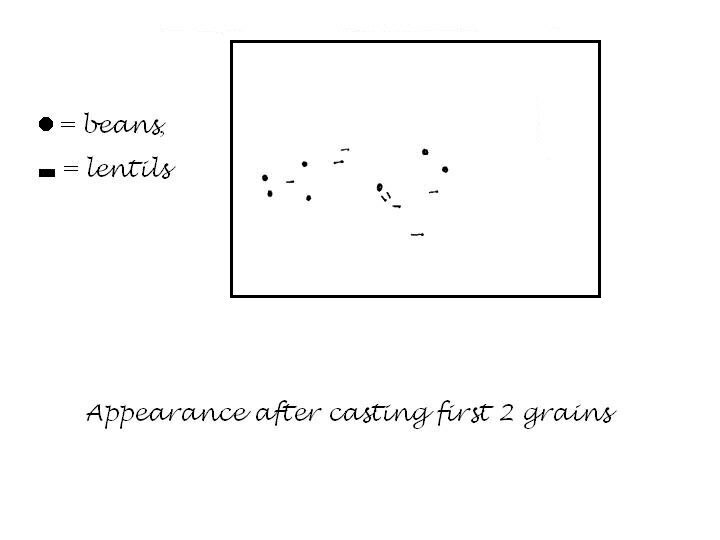 Cast as above, and interpret both the peas of themselves and in relation to the previous casts of beans and lentils. Practice: read this pattern for each of the Querents. Casting #4. Small beans. (Arv of mental/philosophical/spiritual matters) In casting have the Querent concentrate on a specific problem or aspect which is concerning him/her at this time. Interpret as with previous casts. Practice: read this pattern for each of the Querents. Same key as before. Casting #5. Mustard seed. This is used as an adjective to the other seed "nouns", and indicates direction --the path events will take Ask Querent to concentrate on focusing the patterns. This casting will show where the focus or emphasis or main line of the Casting lies. Now comes the hard part: interpretation. The Soothsayer has, of course, studied the Querent and her/his interpretation is modified by what he/she sees there. The combinations in which grain falls, as well as compactness or dispersion of pattern of each grain, also affects the reading. The Soothsayer must now concentrate on the fall of the grain and visualize shape/form and relationship of the various grains together. For example, if the bulk of the lentils (home) fall near or within the major pea (love) configurations, this indicates, perhaps, love and happiness at home -- or that a home should go with love and happiness. The more closely the patterns are interwoven, the more interdependent the arv. Opposites in close conjunction may indicate trouble in whichever is the major pattern of the two. As can be seen from the arv given, there is no provision for health and trouble indicators. These must be read into the seed, with reference to the Soothsayer's reading of the Querent's character. The grain, after all, is a focus for the Soothsayer's own clear sight. Be guided by hunches, intuition, and insight; be open to external stimuli. Something may turn up that is totally off the wall. After this, lift the cloth at the corners to pool the grains and sweep them into the empty bowl. The Soothsaying is done. ©2004 by Jane T. Sibley,Ph.D., known in the Society for Creative Anachronism as Mistress Arwen Evaine fert Rhys ap Gwynedd, O.L. Used by permission.